Ahhhh, the ultimate pedalboard ! How many of you haven't lusted for it? I mean, isn't it every guitarist's goal to put together the pedalboard of their dreams? I have been thinking about it from time to time. A big one that has all of your favourite pedals in it. Vintage as well as boutique, totally switchable, easy to carry, no trouble supplying every pedal with the right voltage etc.etc. 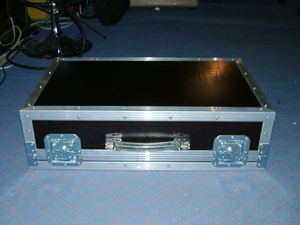 Here is how I got my pedalboard: I had just sold an old Marshall head and had made a good profit on it. As usual when I have some cash left I didn't waste a second. I began to plan: What amp should be my next? When asking Fred about which amp he thought I should buy, I get this somewhat tired answer. "Why don't you do something about all of your expensive pedals, that you always say you want to use, but never do". What a bore, was my first reaction, but thinking about it really made sense. I had been complaining about taking unprotected and unconnected pedals to gigs. First thing I did was decide which pedals to use. I ended up with 14! Starting to measure and weight the pedals I realised, that unless I played stadiums and paid roadies, it wouldn't work. So I focused on being able to quickly change pedals for different gigs instead. The final number of pedals stopped at 8, plus a tuner. A problem I used to have on earlier boards was that especially old pedals degraded the bypassed sound. I started to look for some kind of true bypass device. Finding stuff like the Carl-Martin Combinator, but it was too big and didn't quite work the way I wanted. I had almost given up when I stumbled upon a site called Pedal-Racks. They had something called a True Bypass Strip that looked exactly like the thing I wanted. Talking to the manager Tom Peck I decided to order a 6 loop strip with a tuner out and a general switch. With that taken care of I had to find a power supply that could work with different voltages and still power my Whammy that needs 500-1000 mA 9V AC. Tom said he was working on a power supply, but it needed some tweaking. 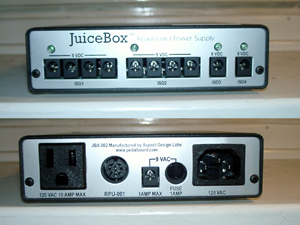 I looked around some more and found that a lot of people spoke very highly of pedalboard.com's Juice box. It looked like the thing to have, so I ordered one. OK, I have the pedals, the true bypass strip and a pro power supply. What's next? Well, its called pedalBOARD isn't it ? Since I'm not very practical, I don't have any idea how to build a board. Even less a case to put it in. And why shouldn't I have a pro build my board and case when everything else is pro stuff? Who does this in a small country like Sweden? Not that many as it turned out. But I was lucky. I happened to stumble upon one of Sweden's best kept secrets: Ludde Widegren of Stage Design. Ludde owns a recording studio but he also builds cases and pedalboards for friends and customers. We started to talk and I explained what I wanted out of the board, and he told me what was practicly possible and what wasn't. When we had settled on the number of pedals and basic design, I pretty much gave Ludde free hands to put it together. 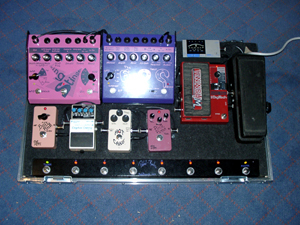 We set the pedalboard up like this: I decided not to put the Wha in a loop. It has a true bypass switch and it feels more natural to switch it on and off by stepping on it. From the Wha the signal goes in to the input of the strip. After that it's patched to all the boxes. Distortion effects first, modulation and time effects last. Some of you might say "this true bypass thing is cool and all, but he will still lose signal due to the long cables". Very true! I first put the Baby Pink Booster (BPB) in the last loop. But when switching the loop on and off with the pedal off just to hear how the buffer worked, I really got a surprise. With the pedal out of the signal chain the sound was a bit dull and lifeless, but switched in the highs was restored. Instead of taking the output of the strip to the amp, I routed it to the BPB. So the BPB is last in line, always in the signal path thus freeing a loop for yet another pedal (yes!). What I ended up with is a combination of true bypass loops and buffered pedals that I think is an excellent compromise. In the pictures you can't really see how it all is patched, but I'll try to explain. As you can see the board is not flush to the case, and it's somewhat angled. This is to give room for all of the cables that we didn't want on top of the board. The board is fastened with two screws into the bottomplate, and the strip is only held in place by the snug tolerances and its cables. The power supply is fastened underneath the board, so once you have unscrewed the two bottom screw's and disconnected the strip you can just lift it straight out of the case. This has been both a fun as well as a time consuming project, but I'm really glad I finally did it. I would like to thank Ludde Widegren for his time and expertise, and Tom Peck for helping me out and answering my questions.